I've joined the dark side; the Mac dark side. My family is a PC family. I remember typing my 3rd grade papers on my super advanced DOS computer with a whopping 256 mb of storage space. I thought for sure this would get me disowned, but it was time for a change! For the past several years, I've had an HP Pavilion laptop and while its served me just fine, it has....quirks. Aside from the fact that it weighs a ton, if you pick it up to fast, the battery falls out of the bottom and when its not plugged in it only lasts about an hour. So, quirks that make it basically a desk top. Not helpful at all considering its supposed to be portable. I needed something lightweight, durable, and was strong enough to run Adobe Creative Suite. Nothing too demanding, if you ask me. I spent a lot of time on CNET searching for something new, but found that my options were pretty limited if I wanted a straight up laptop. The new rage is the tablet/laptop combo thingers that are either very expensive, don't actually run windows, or are such new technology the jury is still out on its quality. 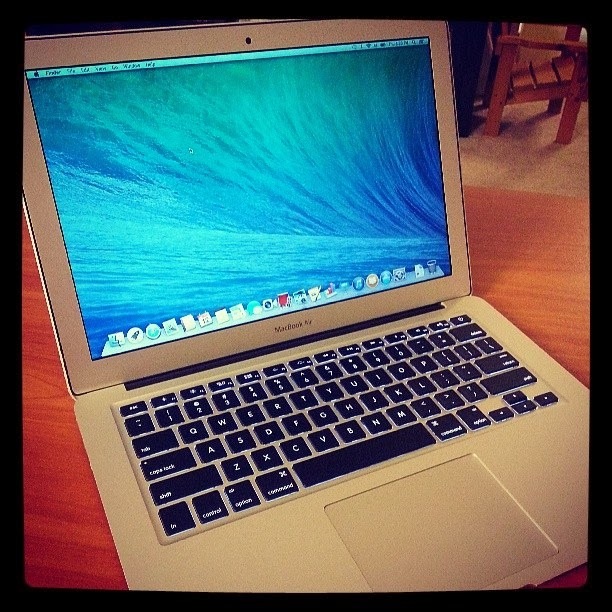 I kept coming back to the MacBook Air. J has had a MacBook for several years now. A few years ago while my HP was in the shop, I was borrowing his Mac to blog and hated the thing. I don't know what it was, but I felt like it was completely backwards and counterintuitive to everything I knew about computers. Well, I'm not sure what has changed since then, but DAMN I LOVE THIS THING. I ended up with a 13.3" MacBook Air with a 128 GB SSD. This thing boots in 15 seconds, was set up in under 10 minutes, and works like a dream. 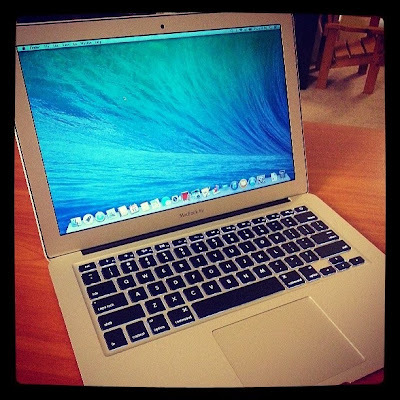 I was super hesitant to get a Mac and was ready for a huge learning curve, but it has been incredibly intuitive. Maybe having an iPad the last few years has prepared me? Who knows. Between the iCloud, crazy battery life (~10 hours), and how lightweight it is, I'm in love. So here I am. The girl raised on PCs sitting with her Mac. Let the PC vs. Mac smack talk begin.